What is the sign for ‘follow me’? I prefer to use the sign for come instead of follow because it is simpler. What’s the sign for empty? Would I use all gone? This sign is made by placing your left hand down. Put your right middle finger on the back of your left hand. Move your right hand from your left wrist to beyond your knuckles. Hi there, my little one and I play a “where is” game when out & about. Could you possibly tell me what the sign is for here it is/there it is? You simply sign here or there. The qualifier it is is not needed. 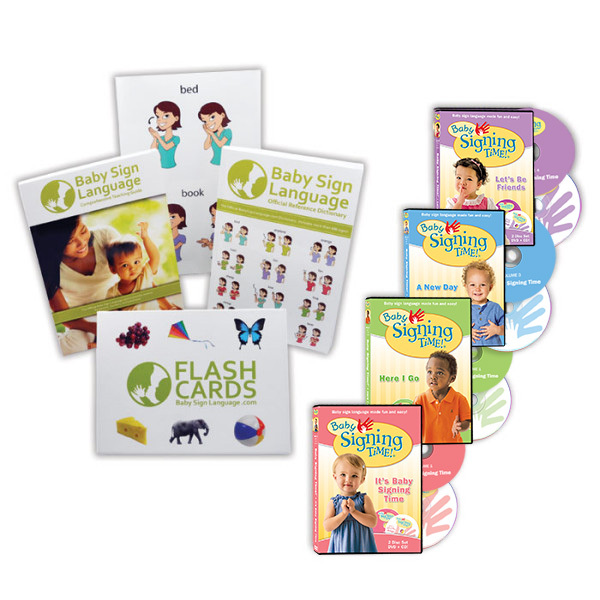 I encourage you to read our guide to teaching baby sign language online or by buying the kit. More is signed by having your hands closed with fingers meeting at the center of your body. Hi, what is the sign for hammer please? The sign for hammer is as follows: Close your dominant hand with thumb at top a as if holding a giant nail. Use your dominant hand to mimic a hammer by closing all fingers and extending your thumb. Hammer the nail twice. What is the sign for ear? Most body parts are signed by pointing to the body part with the index of your dominant hand. The sign for hold is your dominant hand in a fist going around in a clockwise circle in front of you. I see that you mentioned you added ‘home’ for the signs, but I can’t find it? Can you help please? http://www.babysignlanguage.com/dictionary/h/house/ the sign is interchangeable. Can you tell me the sign for fountain please? Tap your chin with your dominant hand making a letter “w” then spread your fingers on both hands and move them outwardly as if sprinkling water. Hello and thank you for compiling all of these signs! My son is almost 2 and he is picking up signs fast, he’s trying to talk more too. I really think being able to communicate through signs is boisting his confidence to try speaking more. You have saved me many a tantrum I’m sure! Can you tell me how to sign firetruck? Firetruck is a combo sign, sign fire and then sign truck. The sign for have is achieved by holding “bent” handshapes a few inches out from your upper chest. Move your hands back and touch your chest. Can you share the sign for “hedgehog”? To sign hedgehog place your dominant hand by the side of your head with fist closed. open your hand to create a fan with your fingers representing the hedgehog. Hi! Great dictionary! Are there common name signs for popular children’s characters? For example, my 14 month old loves The Gruffalo, and we sign snake, mouse, bird, frog, squirrel, etc., as we read. Where could I find what is used for “Gruffalo”? Why don’t you try the sign for monster plus the letter G? What is the sign for hammock? thanks much! The sign for hammock in American Sign Language is quite complex. At home we simplify it to make it baby-friendly by shaping our dominant arm into a U to mimic a hammock and placing our dominant hand in the bend of the elbow facing up and curved to mimic a person resting. We swing back and forth several times. Would like the flash card for fetch please. Please and thank you. I would like to know how to sign “God bless you” or “bless you” after a sneeze. P.S. I love your website. I’m along with my grandchildren are learning to sign. We love to look up animals sign. The sign for bless you in response to a sneeze is done by placing both hands closed into a fist and facing each other in front of the mouth. Lower the hands both at the same time while opening the fists into wide-fingered hands, The sign finishes at about waist-high with both hands open wide facing downward. Could I request “empty”? My daughter’s at the putting-things-in-and-taking-them-out stage, and empty would be a great addition to our signing vocabulary. The sign for “empty” is made by placing your left hand down. Put your right middle finger on the back of your left hand. Move your right hand from your left wrist to beyond your knuckles. (If you are left handed do a mirror image). Could you add the sign ‘fly’, both meanings (insect and to fly) to the dictionary? ADMIN: Thank you for your suggestion to add the baby sign for fly. We have added it to the list of pending words. What is the sign for “great-grandmother” and “great-grandfather”? My grandparents are very integral in my daughter’s life. You can do the signs for great grandparents by doing a triple motion. You will recall that the grandparent signs are similar to the parent signs, but are a double motion. To indicate great-grandparents, add a third motion. I teach one-year olds. We are doing a Fairy Tales theme. I would LOVE an illustration for the word. Thank You! 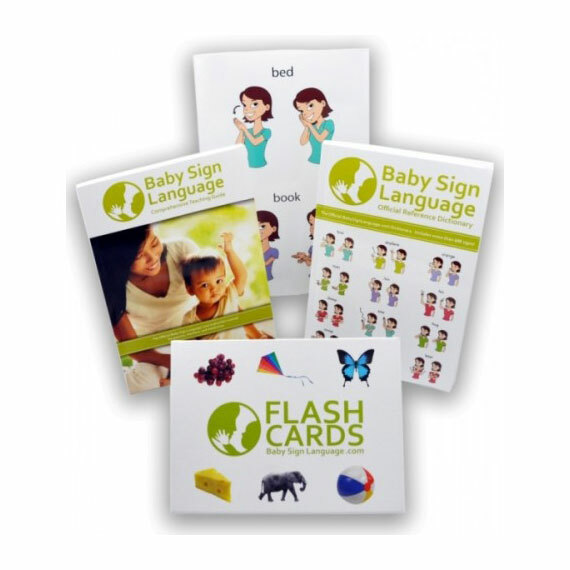 Thank you for your kind suggestion we have added the baby sign for fairy to our list and will try to have it up as resources become available. Can you add Body parts such as head, eyes, foot, hand or do you just point to the body part? For body parts, the sign is usually just pointing to the part. What about a sign for “wash” or “clean” for after meals when they need their faces washed? And also “help” and “down”? I think my daughter would be a lot happier if she could communicate those things. Thanks for the suggestions. We have added those signs to the dictionary. I would love to teach my son the sign for “home”. Could you add this one? Thanks! 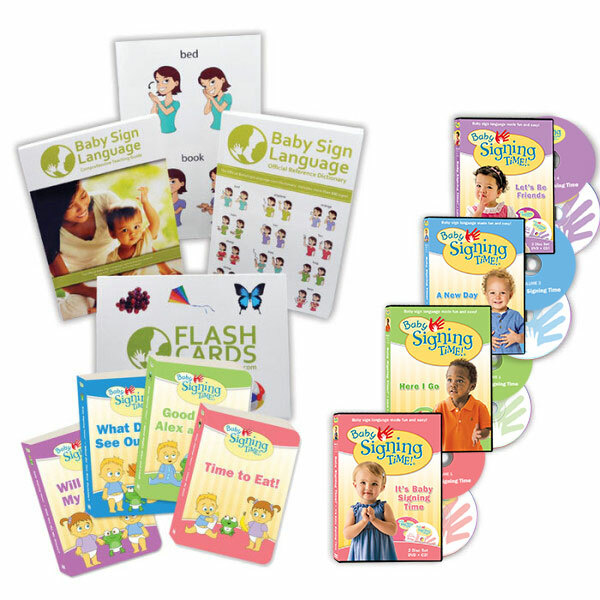 We have added home to the baby sign language dictionary. Thanks for making the suggestion. “Gentle” would be a great sign to have here. We have added gentle to the dictionary. Thanks for suggesting it. Thanks for this great resource. I’m the owner of a small child care in SE Portland, OR and my adoptive baby daughter is facing some language challenges. Your site is very helpful. Is there a sign for help? I find that teaching kids to ask for help reduces tantrums and frustration. Thanks! I saw the post you are adding about 800 more signs…. that is great! I was going to suggest a few but it sounds like you have them covered. I look forward to seeing them. Having a person show you through your video clips is so much easier than reading a sign through pictures. Thank you for this great tool. Will you be selling a video in the future? If so, may I suggest having the adult sign and then a young child sign it as well so the adult learning can see the difference in physical skills levels so they more easily recognize their own childs attempt at the sign. Your website is the most user friendly I have found. Hi, do you know the sign for ‘help’? I think that would be really helpful lol. Help looks like a thumbs up sitting on top of your hand. Then move both hands upward. It is like you are giving someone a big thumbs up for helping you. You will find it in the dictionary. Hi, could you tell me the sign ‘to be picked up/carried or held ‘ many thanks. Most people use the sign for “up” to indicate being picked up or carried. How do you know the sign for god and jesus. Hi! I teach one-year-olds and I LOVE your illustrations! I was wondering if you had one for eat/food? I know the sign, but I would love to put it on the wall where our children eat as a reference for them! Thanks! I can’t believe we missed eat the first time around. We will be adding another 800 signs in the next two months and “eat” will definitely be among them. Can you please add Eat and Food? What is the sign for goodbye? We added goodbye. The sign just looks like you are waving goodbye to a friend. Is there a sign for helicopter? My one year old loves them. We added helicopter. Thank you for suggesting the addition, it is a fun sign! Do you have a sign for Guitar? Thank you! We have added guitar. Thank you for making the suggestion. What is the sign for guinea pig please??? Afraid I don’t know Guinea Pig, and I couldn’t find it in my dictionary – often less used signs like Guinea Pig are finger spelled. I would substitute another easy to perform sign like mouse.